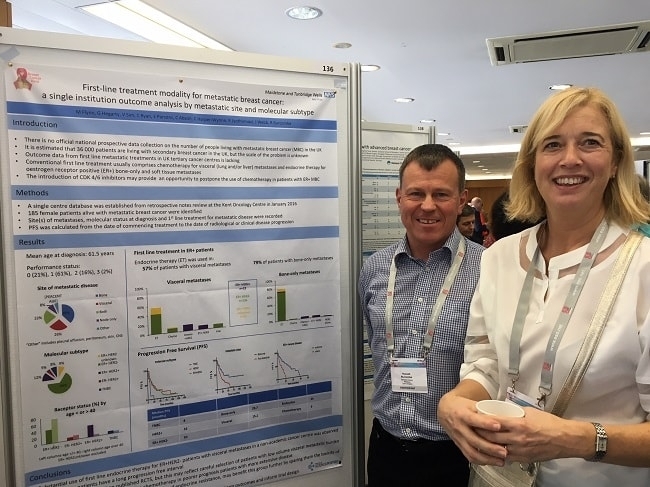 Maidstone and Tunbridge Wells’ very own Dr Russell Burcombe (Consultant Clinical Oncologist) and Claire Ryan (Macmillan Nurse Clinician) are pictured presenting research at an International Breast Cancer meeting. The Lisbon Advanced Breast Cancer (ABC4) Meeting took place in November 2017. Breast Cancer Kent was able to fund the professionally produced presentation materials. The presentation was very well received on a European wide basis and is a great accolade for Russell and Claire. ABC is a major international conference for advanced breast cancer. Attendance there has helped our Clinicians keep in touch with their European and Worldwide colleagues to share best practice and learn about new advances in research and treatment. The charity is proud to have been able to support them.